Hair extension is an accessory which can easily be attached to your own hair to achieve volume or length and create a variety of new hairstyles. It is a quick way to have a long hairstyle without waiting for months for your hair to grow. It can be achieved by different methods, such as Clip-in, Weaving, Bonding, Braiding, Strand by Strand and so on. EvaHair.com currently provides clip in hair extensions which can be applied by yourself easily instead of going to a salon. How to choose the length of your hair extensions? No matter how long your hair is, clip in hair extensions should be worn from a lower part, about 2-6 inch down from your hair top. 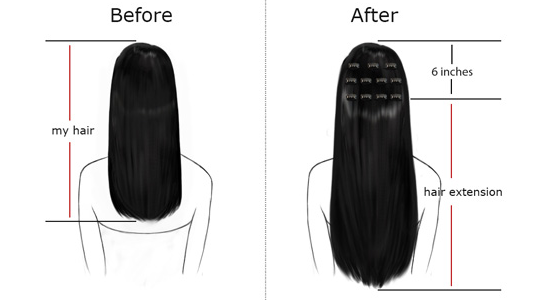 Please note that, we highly recommend you to wear clip in hair extensions when your hair is longer than 6 inch. How to apply clip in hair extensions? Normally, we wear 8-piece clip in hair extensions as the picture shows below. One 8 inch piece, one 7 inch piece and one 6 inch piece on the back of your head, four 2 inch pieces on each side of your head, and another 6 inch piece you can adjust according to your own needs, apply to the back of your head or cut to 3 inch for the each side of your head. Human hair extensions can last a much longer time than syntehtic ones. And it also depends on how frequently you wear your hair extensions, which style you select and what you do to them, for example are you regularly applying heat on them? Evahair.com only offers our customers high quality indian virgin human hair clip in extensions, and normally the hair can exceed 1 year assuming that they have been well installed and maintained. Hair color is very dynamic since the reflection commonly differs depending on the frequency and intensity of the light hitting the hair. When choosing among the colors, you could try looking for which one is the closest to your natural hair color. This would make it undetectable to onlookers. If you want to choose one which would complement your existing hair, then you could go for hair extensions colors that are slightly different from your natural hair color but would enhance your look beautifully. Can I apply a hairdryer, hot roller, tong or other styling equipments on my extensions? Since our hair extensions are all made of 100% premium Indian virgin human hair, you can use all of the above. Can I color the hair extension? Just like your natural hair, they can be curled, ironed and straightened. However be aware that overuse can cause the ends to become dry and brittle just as your own hair would, so make sure you use a heat protector. Indian virgin hair can be professionally colored to a darker color. And the lightest color #613 can be dyed to any color you want. Nevertheless, it is not recommended to color our pre-colored hair since hair extensions have been previously treated by a chemical method. 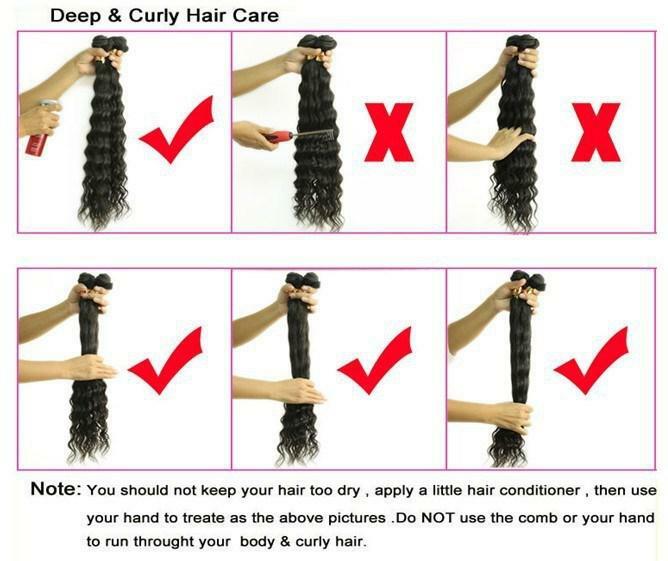 Double processing the hair will lead to premature shedding and dryness. How often should I wash my hair? How to care hair extensions? We recommend washing your hair and use a sulfate free clarifying shampoo and conditioner at least once a week with lukewarm water. Please note that products and shampoo or conditioner with oil can weigh down your hair extensions and cause slippage or premature shedding. 1. If your hair extensions are feeling dry, use a moisturizing shampoo and conditioner every so often to restore luster. Rinse in cold water until all shampoo residues are gone. 2. Chlorine and salt water can discolor your extensions so try to wear swimming gear cap or make a ponytail while going for swimming and beaches. 3. When you can, always let hair air dry and avoid the direct sunlight. Pat out excess water on soft towel for 5-10 minutes. 4. For wavy and curly hair, do Not comb or blush when wet. After the hair extensions are dry, give it a shake and it should bounce back to the shape.